Yesterday afternoon was one of those blissful afternoons when I felt relaxed and unburdened by chores. I spent the whole afternoon playing with Turtle apart from hanging out a couple of loads of washing. That was a good excuse to move our play outdoors for awhile anyway so it didn't feel like work. We have recently been on a trip to Bali and I'm pretty sure the glow of the holiday is still with me. It's possible that the acupuncture treatments I recently started are also responsible for my relaxed state of mind. As I basked in the joy of sitting still and really concentrating on Turtle I appreciated one of the main reasons that she was having such a good time playing. As mentioned in striving for a minimalist birthday, we are members of a toy library. We had been to exchange library toys in the morning and had returned with the obligatory car for outdoors (that I had decided we wouldn't get but then succumbed when Turtle brought it out as soon as we arrived), a puzzle, a stove, some puppets to play with while singing nursery rhymes and a Vtech school bus with rotating letters that plays music and calls out words starting with the letter touched. Not bad for a half hour outing! From experience I have started to leave the toys in the car after our visit (except the bus this time since Turtle was playing with it on the way home). Then it is nap time (all going well!). Then it is play time. It is so much fun watching Turtle use her library toys. 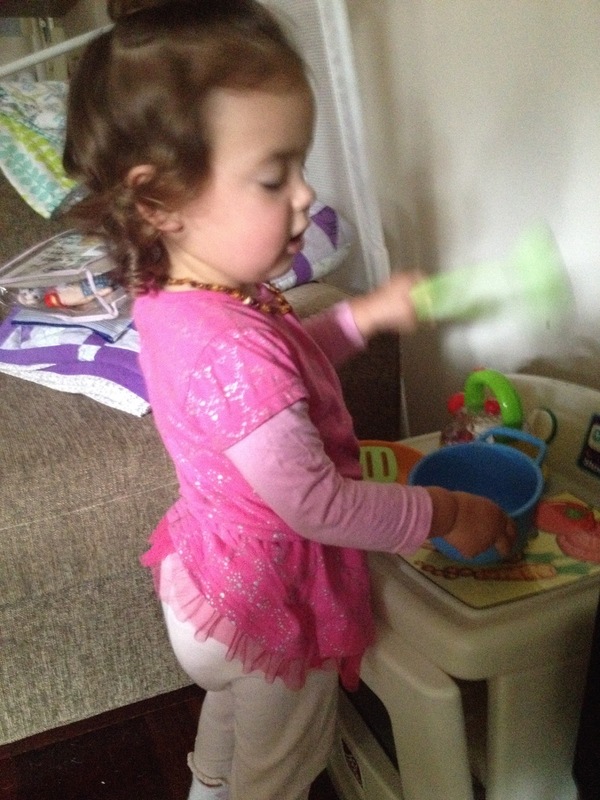 Last fortnight we had a tea set and she played with it for at least half an hour as soon as it was out. Played with it BY HERSELF! This has never happened before. I didn't know she even knew what to do with a tea set. I have no idea where she learnt it but she was setting up cups on saucers and pouring out tea from the pot with absolutely no input from Mr Fix It or I. After a few days the game became more about feeding everyone with the teaspoons from cups or saucers. The poor dogs were being harassed in their beds and chased around the house as she tried to generously "feed" them. Of course it is always difficult to predict what toys will be a hit. Sometimes you pick something up that you think looks great and when you get it out at home and play with it for a minute you realise it's actually quite boring. Other times you pick something out without really looking too hard and it is a winner. The tea set was a surprise for me. Another great toy has been a car that has a handle at just the right height for Mr Fix It and I to push it around (saving our backs!). We have even driven Turtle to the park in it. That is the beauty of the toy library. You can't predict what toy is going to be engaging or fun. If you buy it then you are stuck with it. Babies change so much over such a short period of time. 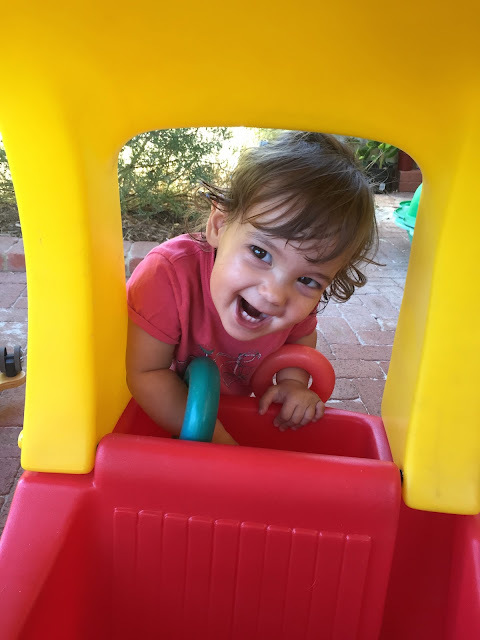 What is challenging and fun for a 12 month old could be obsolete for an 18 month old. Fleeting attention spans make toy choices challenging too. We borrow library toys for a 2 week period. Usually that is long enough for Turtle to have figured out how to do a puzzle or how to operate the toy herself depending on the level of difficulty. It is long enough for her to have something around and begin to ignore it. Basically it is long enough for her to become bored with a toy. I think toy libraries are a great way to keep children stimulated, learning and involved with play. We get so much out of ours. I am so glad we decided to join one. Are you, or have you ever been, a member of a toy library? Do you find your children get a lot out of it?